ProBuilt Railing is no longer available to us. For a similar style deck railing consider the Regal Aluminum Deck Railing. 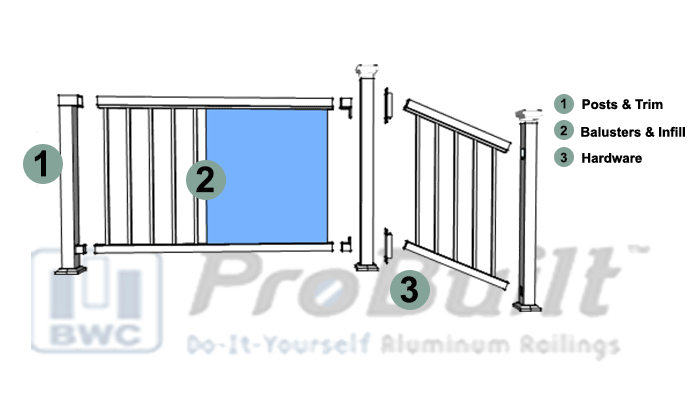 Use ProBuilt railings on your deck, staircases, or to safely and elegantly enclose sun decks, balconies, and swimming pools. Choose the railing style and color that best suits your home. This is the easiest system for the DIY installer. Fast and easy installation, this has been our preferred system for custom decks, exterior deck stair installations, and pool or patio surrounds. This module system ships easily, installs fast, performs great. Watch the video to learn more about installing Probuilt Rails.